· Listen to this Books of Psalms and Proverbs KJV Bible Audio on the go with any audio CD player. 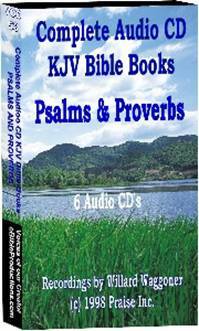 · Listen to this Complete KJV Books of Psalms and Proverbs audio with any audio CD player. · You can now hear God speak to you daily as you listen to this while you are working around the house or driving.
. Pleasant voice - easy to listen to makes a wonderful gift for shut-ins, elderly, and any one who wants to listen to the Bible on their TV with your DVD player.